Egg filled pancakes (ji dan guan bing 雞蛋灌餅) are Beijingnese breakfast sold mainly by street food vendors. It's cheap and tasty. Similar to Indian roti or tortilla wrap with a difference. Need a bit of practice to get it right how to fill the pancake with egg. Here is how I make them. This recipe makes 5 pancakes. Dissolve salt with water then stir into flour to form a dough. Leave dough to rest for about 20 - 30 minutes. Then knead till smooth. Mix 2 tbsp sesame oil with enough flour to make a sticky paste. Dust dough with flour. Spread it out to form 1 cm thick disc. Then add about 1 tsp of the oily paste, spread it on the disc. Wrap this up and seal like a filled bun. Then flatten it, dust with more flour and roll it out into a very thin about 15 - 16 cm round pancake. Heat a pan till quite hot, brush with cooking oil and put the pancake on. Heat till lightly brown underside and top of pancake beginning to puff up. Turn over the pancake. The pancake should puff up quite quite high very quickly. Using a pair of chopsticks, punch the puffed ball, lift up the top layer with the chopsticks and pour some beaten egg inside the pancake very quickly before the pancake collapses. Let the pancake fry a little bit longer then flip over. Fry the pancake till both sides are brown and quite crisp. Mix hoi sin sauce and chilli sauce together. 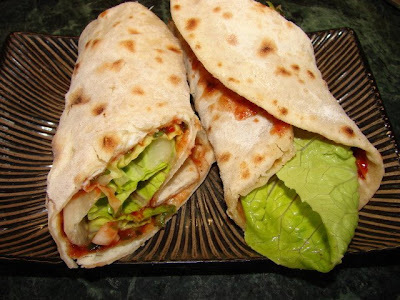 Spread a thin layer on the pancake (not too much sauce, hoi sin sauce is quite salty), then sprinkle on a little chopped spring onion and put 1 - 2 lettuce leaves, wrap up and enjoy while hot. Thanks so much for putting this recipe up - I had these in Dalian and craved them when I got home! I'm so happy to finally find this recipe. Don't know how I missed it earlier; been looking for this for 8 years since our trip to Beijing where we ate this for breakfast every day. Thank you so much for sharing; going to try this tonight! !